Cast your mind back to January when BlackBerry took the wraps off its all new great hope the Z10. At the same time it also unveiled another handset that was in a more traditional BlackBerry style design in the Q10. The big differences between the two is that, just how BB lovers like it, the Q10 has a proper QWERTY keyboard and it also has a smaller screen to accomodate it. We were told at the time that the launch was penciled or March or April, but two months on and there’s no news. Then today The Inquirer spotted that Carphone Warehouse had put the device on its site with a March launch. Weirdly this was amended and it now says coming soon. We don’t know a huge amount about the potential cost of the device. Our educated guess is that it will come in at around £35 per month on contract and £450 without. 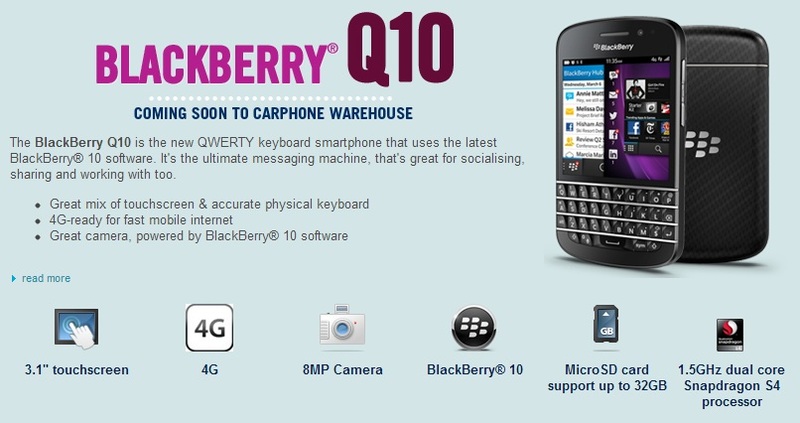 We do know that the Q10 runs Blackberry 10 mobile OS, features a 3.1in 720×720 Super AMOLED touchscreen, a dual-core 1.5GHz processor, 16GB of internal storage expandable to 64GB via microSD and an 8MP camera.